The first quantum-safe video conference was held between President Chunli Bai of the Chinese Academy of Sciences in Beijing and President Anton Zeilinger of the Austria Academy of Sciences in Vienna as the first real-world demonstration of intercontinental quantum communication on September 29th. Private and secure communications are fundamental human needs. In particular, with the exponential growth of internet use and e-commerce, it is of paramount importance to establish a secure network with global protection of data. Traditional public key cryptography usually relies on the perceived computational intractability of certain mathematical functions. In contrast, quantum key distribution (QKD) uses individual light quanta in quantum superposition states to guarantee unconditional security between distant parties. Previously, the quantum communication distance had been limited to a few hundred kilometers due to the channel loss of fibers or terrestrial free space. A promising solution to this problem is exploiting satellite and space-based links, which can connect two remote points on Earth with greatly reduced channel loss, as most of the photons' propagation path is in empty space with negligible loss and decoherence. 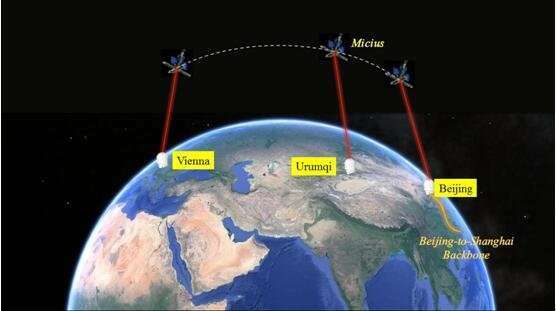 A cross-disciplinary, multi-institutional team of scientists from the Chinese Academy of Sciences, led by Professor Jian-Wei Pan, has spent more than 10 years developing a sophisticated satellite called Micius for quantum science experiments, which was successfully launched on 16 August 2016 from Jiuquan, China, orbiting at an altitude of ~500 km. The satellite is equipped with three payloads: a decoy-state QKD transmitter, an entangled-photon source, and a quantum teleportation receiver and analyzer. Five ground stations were built in China to coordinate with the Micius satellite, located in Xinglong (near Beijing, 40°23'45.12''N, 117°34'38.85''E, altitude 890 m), Nanshan (near Urumqi, 43°28'31.66''N, 87°10'36.07''E, altitude 2028 m), Delingha (37°22'44.43''N, 97°43'37.01"E, altitude 3153 m), Lijiang (26°41'38.15''N, 100°1'45.55''E, altitude 3233 m), and Ngari in Tibet (32°19'30.07''N, 80°1'34.18''E, altitude 5047 m). Within a year after the launch, three key milestones toward a global-scale quantum internet have been achieved: satellite-to-ground decoy-state QKD with kHz rate over a distance of ~1200 km (Liao et al. 2017, Nature 549, 43); satellite-based entanglement distribution to two locations on the Earth separated by ~1200 km and Bell test (Yin et al. 2017, Science 356, 1140), and ground-to-satellite quantum teleportation (Ren et al. 2017, Nature 549, 70). The effective link efficiencies in the satellite-based QKD were measured to be ~20 orders of magnitudes larger than direct transmission through optical fibers at the same length at 1200 km. The satellite-based QKD has now been combined with metropolitan quantum networks in which fibers are used to connect many users inside a city with a distance scale of ~100 km. For example, the Xinglong station has now been connected to the metropolitan multi-node quantum network in Beijing via optical fibers. Very recently, the largest fiber-based quantum communication backbone was built in China by Professor Pan's team, linking Beijing to Shanghai (going through Jinan and Hefei, and 32 trustful relays) with a fiber length of 2000 km. The backbone uses decoy-state protocol QKD and achieves an all-pass secure key rate of 20 kbps. It is being tested for real-world applications by government, banks, securities and insurance companies. The Micius satellite can be further exploited as a trustful relay to conveniently connect any two points on the Earth for high-security key exchange. Early this year, the Chinese team implemented satellite-to-ground QKD in Xinglong. After that, the secure keys were stored in the satellite for two hours until it reached Nanshan station near Urumqi, by a distance of ~2500 km from Beijing. By performing another QKD between the satellite and Nanshan station, and using one-time-pad encoding, a secure key between Xinglong and Nanshan was then established. To test the robustness and versatility of the Micius, QKD from the satellite to Graz ground station near Vienna was carried out successfully this June as a collaboration between Professor Pan and Professor Anton Zeilinger's group. Future experiments are also planned between China and Singapore, Italy, Germany, and Russia.